Posh manager Graham Westley celebrates his side's FA Cup win at Burton. Photo: Joe Dent/theposh.com. 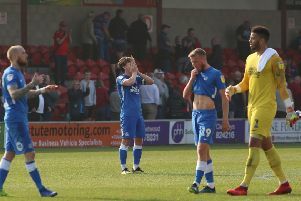 Peterborough United manager Graham Westley is adamant his side are capable of taking the scalps of the best teams in League One. Posh haven’t beaten any of the teams currently in the top eight this season and their next four League matches are against promotion rivals, starting with a trip to Sheffield United on Saturday (January 2). The game at Bramall Lane is followed by games against seventh-placed Southend (home, January 16), third-placed Gillingham (away, January 23) and second-placed Burton (home, January 26). But Westley said: “Results in these games looking backwards this season are not great, but results of the past are not relevant now. What I do know is that I have a set of young players who are adapting quickly to League One and improving rapidly as a result. “We beat Burton on their own ground convincingly in the FA Cup when they were top of the league so the capability is there. “It’s a corker of a fixture at Sheffield this Saturday. It’s a great stage to perform on and we are looking forward to showing what we can do.